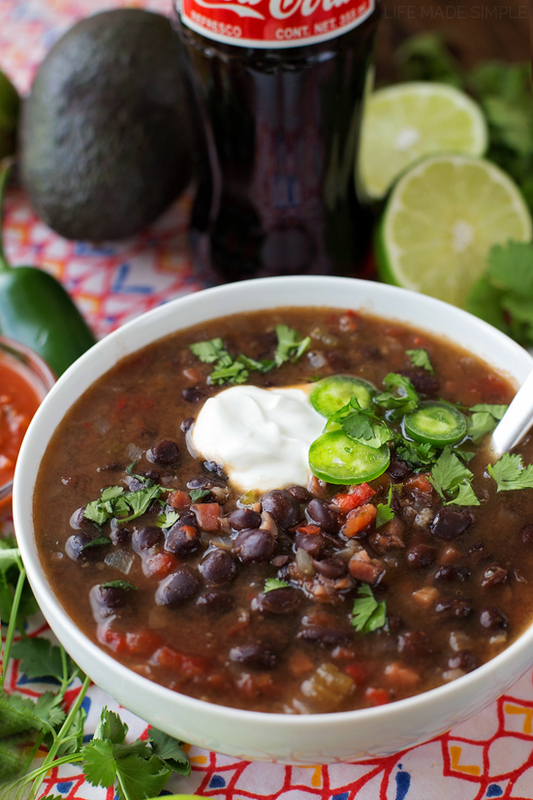 Guys, I’ve made about 5 different versions of black bean soup over the years and none of them were big hits. They were either too bland, too chunky, or the beans were too hard. We’re pretty picky as you can probably tell, but we had some amazing feijoada in Brazil and crazy good black bean soup in Mexico… both of which have seemed impossible to top. After a lot of testing, I decided my recipe was missing a key ingredient: ham. That’s right. If you’ve still got a ham hock leftover from Easter, you’re in luck! If not, you can easily use leftover sliced ham or thick cut deli meat. This recipe isn’t super complicated. It has a lot of ingredients but I promise they all contribute to the flavor of the soup. The most work you’ll do is chop veggies/ham and open cans. Simple, right?! The rest is all done on the stove. Start by chopping up an onion, a red bell pepper, half of a green bell pepper, a jalapeno, 5 cloves of garlic and a few slices of ham (or if you don’t want chunks of ham you can use a ham hock and toss it in a little later). Saute the veggies in a few tablespoons of olive oil over medium-low heat until soft and then toss in the ham, 3 cans of black beans, 1 can of Rotel tomatoes and green chiles, 2 cans of chicken broth and a handful of seasonings. I used cumin, coriander, chili powder, cayenne pepper, garlic powder, salt, black pepper. I also tossed in some apple cider vinegar, hot sauce, freshly squeezed lime juice and a little bit of cilantro. Once everything came to a boil I let it simmer for about an hour, maybe a little more. The longer you let it go, the better it will taste. But just to clarify, the recipe as written says 1 hour. I felt like at that point the beans were tender enough and the flavor had developed to the point where we could call it good (but feel free to let it go longer- up to 2 hours). As soon as it cooled a bit I used my immersion blender and gave it a few whirls. This is totally optional. 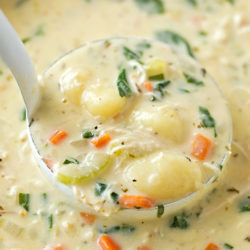 You can keep the soup chunky (as-is) or pour a portion of it in a blender to smooth it out, or do the entire thing until it’s smooth. We liked a little of both, that way the broth was thicker and more substantial. We garnished ours with a dollop of sour cream (which I highly recommend), some cilantro and a few slices of jalapeno. It was divine! So flavorful and it had just the right amount of heat. 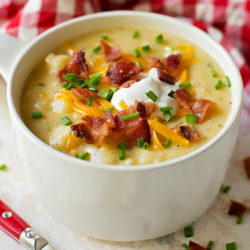 We both really loved this recipe, so much that I plan on making it again and again- it’s a keeper! Next time you’re in the mood for an easy and flavorful one-pot meal, you’ve gotta give this soup a try. I promise you won’t be disappointed! 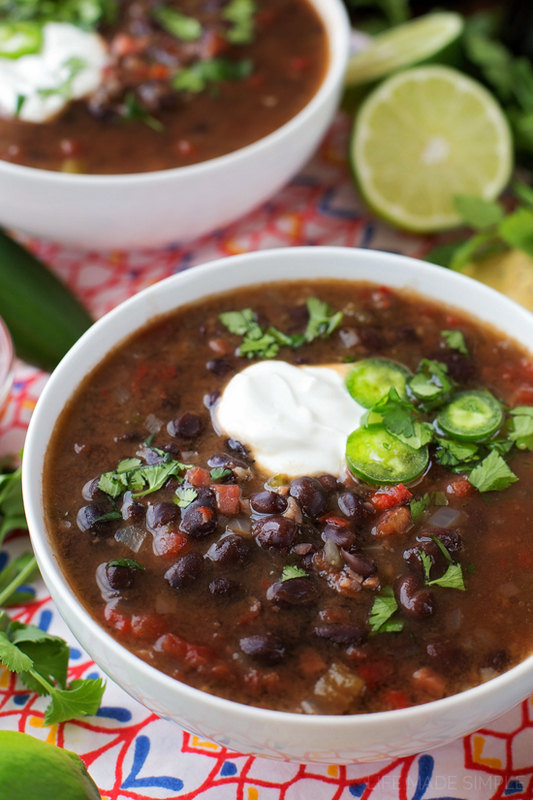 This black bean soup is full of flavor! It's loaded with veggies, protein and is spiced to perfection! In a large stockpot or Dutch oven set over medium-low heat, saute the onion, bell peppers, and jalapeno in the olive oil until tender. Add the garlic and cook for 1-2 more minutes. 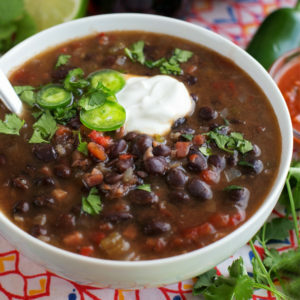 Add the chopped ham (or if using a ham hock add it in now), black beans, tomatoes/chiles, chicken broth, cumin, coriander, chili powder, garlic powder, salt, pepper, cayenne pepper, apple cider vinegar, hot sauce, lime juice, bay leaves and cilantro. Bring mixture to a boil, then reduce heat to a simmer and cover. 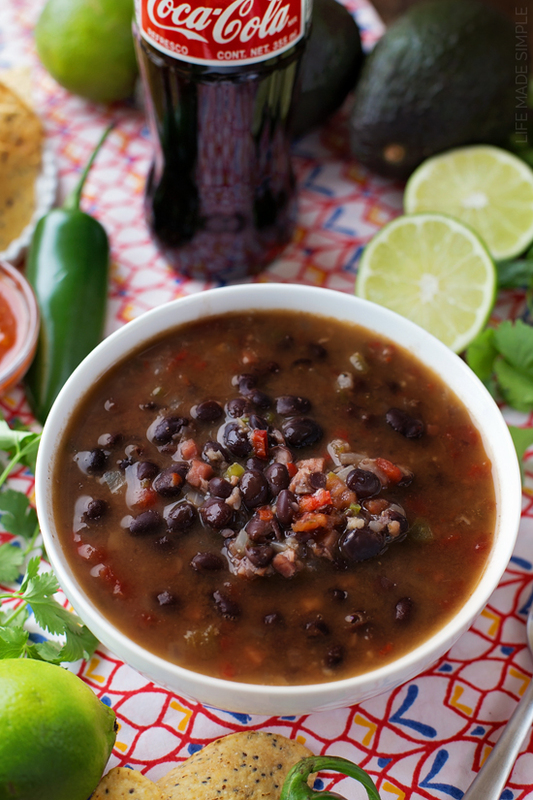 Cook for just a little over 1 hour (or more if you have time) or until the beans are tender. Remove the bay leaves (and ham hock if used). Use an immersion blender or place a few cups of soup into a blender (this will give you a bit of a thicker stock, but is optional). Serve and garnish as desired. 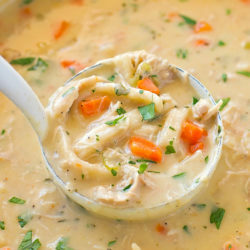 *You can use thick cut slices of ham and cube them in about ¼" cubes or if you prefer to not have chunks of ham, use a ham hock and place it in the soup right after sauteing the vegetables. Remove it along with the bay leaves before blending or serving.